We are well into 2012. How are your resolutions going? My resolutions are going better than expected, but still tough to remember. 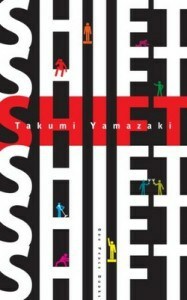 Reading Shift: 13 Exercises to Make You Who You Want to Be by Takumi Yamazaki gave me some food for thought. Yamazaki details three brain blocks to achieving you goals. While his book is fundamentally different than “The Secret,” it does have some similarities. He explains how your concept of self-image can be limiting. He also talks about your life equilibrium. And lastly, he talks about how your brain is only physically capable of processing a very small percentage of input and how that can limit you. The final chapters are about how to circumvent these three brain blocks and work through them. Overall, I think that this is a nice bite-sized motivational shot to help kick start your goals again. Usefulness of content aside, Shift is a very visual and tactile book, as well. The pages have plenty of calming white space and simple, yet concise, little illustrations. The pages feel sturdy and satisfying under my fingertips. The dustcover has an okay design, but the stark white with the unobtrusive red title that lies underneath is way cooler, in my opinion. So, if you are looking to regain some momentum on your goals for the year, check out Shift: 13 Exercises to Make You Who You Want to Be!